Rt Revd Bishop Paul Bayes at Liverpool Pride 2017, wearing the rainbow cross presented to him by the Open Table community during his first visit in July 2015. 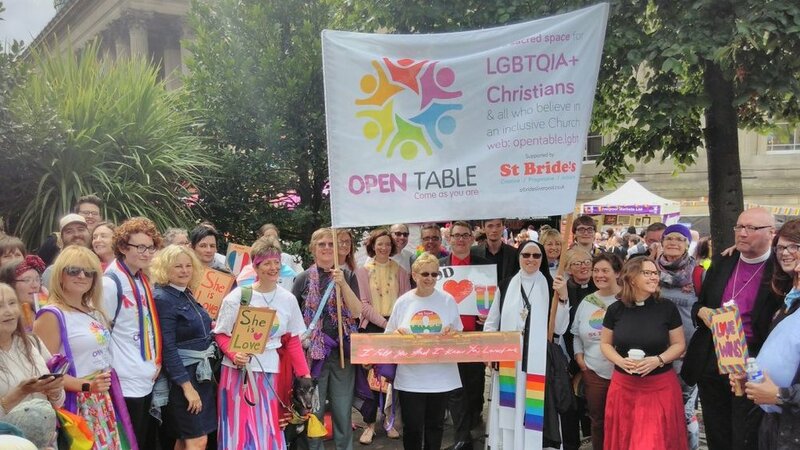 THIS WEEKEND the Bishop of Liverpool, Rt Revd Paul Bayes, will join the celebration of Open Table, an ecumenical Christian worship community which offers a warm welcome to people who are: Lesbian, Gay, Bisexual, Transgender, Queer/Questioning, Intersex, Asexual (LGBTQIA+) and all who seek a more inclusive Church, writes Kieran, one of our Local Missional Leaders. Bishop Paul explicitly mentioned 'gay and straight' among those for whose company Jesus longs at this table, to receive his 'absolute welcome'. In return we gave him a lapel pin in the form of a rainbow cross. The publicity around Bishop Paul's visit to Open Table was one of the catalysts that led to the community spreading beyond Liverpool - one year later there were four Open Table gatherings, now two years on there are ten groups sharing the Open Table vision hosted by three Christian denominations, with plans for at least four more groups to follow, and many more enquiries about sharing our experience. His first visit appears to have made an impression on him. In November 2015, Bishop Paul mentioned Open Table in a reflection on his first year as bishop of Liverpool at the Anglican National Fresh Expressions Conference held at Southwark Cathedral. As a result of the dialogue we had begun, my husband and I became authorised by the Diocese of Liverpool as Local Missional Leaders to enable the growth of the Open Table community in Liverpool and beyond, which we began in March 2016. 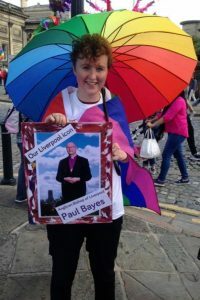 The theme of Liverpool Pride in July 2016 was 'Icons' - one of our community chose to march carrying a photo of Bishop Paul in recognition of his growing support for our community - she wrote of her experience here. On the same evening as Synod rejected the House of Bishops' report, the Lesbian and Gay Christian Movement held an event to mark its merger with Changing Attitude and relaunch as OneBodyOneFaith. At the event, each guest received a free poster - one of the designs was inspired by Bishop Paul's call to 'be warmly angry'. This design is now available as a poster, postcard and greeting card from the OneBodyOneFaith shop. He also mentioned that he was 'privileged and proud to be associated' with Liverpool Pride, which announced him as a patron of the charity last month. Finally he marched with the Open Table group and friends from at least six other churches, more than 70 of us in total. When we marched with his photo in July 2016, we couldn't have imagined he would be with us in person this year! So he joins us again to preach and preside at the Open Table communion service, Sunday 20th August 2017, 6.30pm at St Bride's Liverpool. Join us if you can - I will share his reflection here later this month. 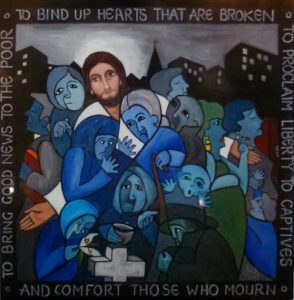 * My husband and co-facilitator of Open Table Liverpool, Warren Hartley, took part in the Shared Conversations for the Diocese of Liverpool - you can read his reflection on the experience here.